A sequel to Sir Arthur C. Clarke's Nebula Award-winning novella "A Meeting with Medusa," this novel continues the thrilling adventure of astronaut Howard Falcon, humanity's first explorer of Jupiter, from two modern science fiction masters. Howard Falcon almost lost his life in an accident as the first human astronaut to explore the atmosphere of Jupiter — and a combination of human ingenuity and technical expertise brought him back. But he is no longer himself. Instead, he has been changed into an augmented human: part man, part machine, and exceptionally capable. With permission from the Clarke Estate, Stephen Baxter and Alastair Reynolds continue this beloved writer's enduring vision and have created a fresh story for new readers. 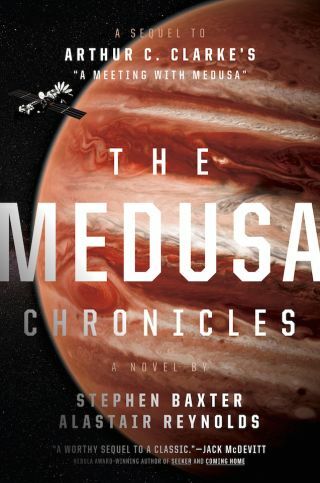 You can read an essay by Baxter here on the spaceships of Arthur C. Clarke, or read on for an excerpt from "The Medusa Chronicles" (Saga Press, 2016) below, from Chapter 35 of the novel. Huddled in a bunker under Vulcanopolis with Chief Administrator Borowski, her second-in-command Bill Jennings, and other senior figures of the planetary government, Howard Falcon was an eyewitness to the brief war for Mercury. It began, in fact, with a surprise attack by the Hermians themselves. In the last few hours the Machines' small fleet of asymptotic-drive ships — frames open to space, crowded with Machines and other equipment — had begun to cruise low over Vulcanopolis and other significant Hermian settlements. But they did not pass unchallenged. Mercury's surface was laced with mass drivers, rails along which packages of raw materials, mined from the rocks, were routinely hurled by electromagnetic slingshots powered by the sun's ferocious light, out of the planet's gravity well and to destinations across the solar system. Now, in a synchronized attack — based on observations of the Machine ships' somewhat repetitive patterns of motion—the mass drivers threw up screens of rock and dust, pellets heavily masked with stealth technology, barely detectable. And the Machine ships drove headlong into the flak. The encounters lasted only seconds. It was estimated later that fully ten per cent of the Machine ships were disabled immediately. Some even crashed, leaving new, briefly glowing craters in the Mercury ground. But the cheers of the watchers at Vulcanopolis had hardly been stilled before the surviving Machine craft pulled back, gathered in new formations, and in response began a steady investment of mankind's facilities on the planet: the ice mines the mass drivers, even the precious solar-power farms, leaving only the habitable enclosures intact. Now new rumours spread fast around the bunker. The Acheron was heading for Caloris, coming in for the kill. You will understand how I have come to be something of an amateur student of my distant grandfather's life and career. My family name comes in fact from the married name of the Prime Minister's daughter, Mary, my ancestor. She had seen service herself in the course of the terrible world war for which he is best remembered, and at its close worked as an aide-de-camp to her father at his momentous summits with Roosevelt and Stalin, meetings that shaped the world for the next half-century or more. I dare to dream that he would have been proud to know that someday one of his descendants would fulfill the role of democratically elected President of a unified world.